and lift loads up to 1000 pounds. pounds contribute to musculoskeletal work place injuries in employees. return on your investment dollars.  Maximum incline rating: 6 degrees. 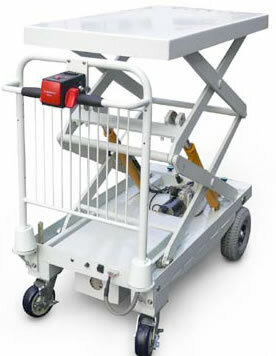  Lift Speed: 17 seconds  Electric lift allows for precise control up or down of 1000 lb. speed even on an incline. Carts, Powered Hand Trucks, Self Propelled Carts, and Motorized Platform Trucks from your source for material handling equipment.